WHO Disclaimer: The boundaries and names shown and the designations used on this map do not imply the expression of any opinion whatsoever of the World Health Organization concerning the legal status of any country, territory, city or area or of its authorities, or concerning the delimitation of its frontiers or boundaries. Dotted and dashed lines on maps represent approximate border lines for which there may not yet be full agreement. 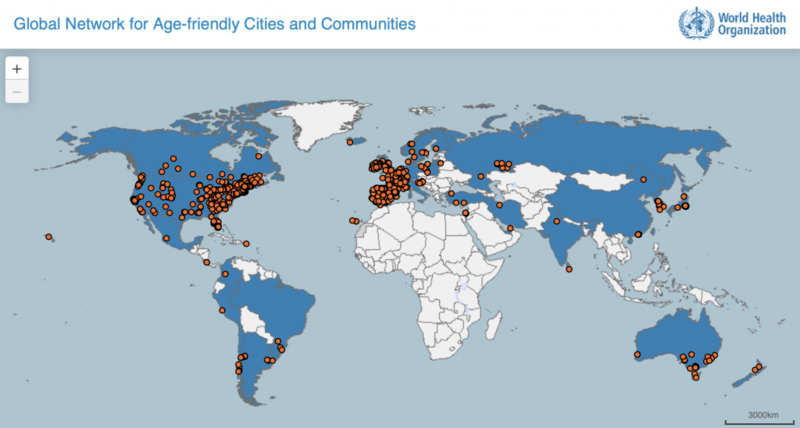 Please note that this map reflects members in the Global Network for Age-friendly Cities and Communities at the time of update. This map is updated quarterly and may not reflect the most recent changes in membership. Click on the Map to access an interactive version and browse Network members by country. The WHO Global Network for Age-friendly Cities and Communities was established in 2010 to connect cities, communities and organizations worldwide with the common vision of making their community a great place to grow old in. As a response to global population ageing and rapid urbanisation, it focuses on action at the local level that fosters the full participation of older people in community life and promotes healthy and active ageing. ● supporting cities and communities to find appropriate innovative and evidence-based solutions. Membership to the Network is not an accreditation for age-friendliness. Rather, it reflects cities’ commitment to listen to the needs of their ageing population, assess and monitor their age-friendliness and work collaboratively with older people and across sectors to create age-friendly physical and social environments. Membership is also a commitment to share experience, achievements and lessons learnt with other cities and communities. The WHO Global Network for Age-friendly Cities and Communities currently includes 833 cities and communities in 41 countries, covering over 229 million people worldwide.